Once upon a time, the comments section on my regular blog kirk.is made it a social place, with regular commentators, only about half of whom I knew IRL. Social media has moved on, alas. And adding injury to insult, my homebrew comment system got invaded by dirty rotten link spammers. These guys are the biggest jerks in the world. I have about 4,000 days with comments on them (!) but I'd say at least 3/4 of those will turn out to be nothing but comment spam. Even after eliminating the ability for people (and bots) to post links, they kept on coming, and I decided not to give up, rather than invest more deeply into a fix. But, being nostalgic and wanting to shake my fist against the onslaught, I'm going back and eliminating the spam while preserving the conversations. So I built a tool to efficiently drive through each entry and with a click, determine where the good comments started and the bots began, showing the actual entry to the right. If there's no good comments, I click "KILL ALL" and the thing is removed. Other wise, I click a link that says "truncate the comments section here". 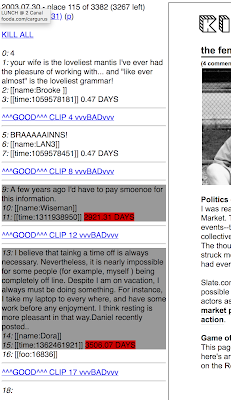 (In the screenshot you get the idea of my crude but functional system: the first line is a count of how many comments in the file (for efficient "See X Comments" labeling when building the blog entry page), then each comment is followed by special lines in brackets "[]", with key/values for their name, and the time they posted. To improve the UI, I make use of the fact that most of the 'bot entries seem to be posted 3000 or so days (i.e. 8 years) after the original entry date - so anything over 1000 days old gets labeled in gray, with a red highlight on the day differential. Anything older than 10 days still gets a light gray treatment. I could probably just write a script to discard any comment coming 1000 days or more after, but besides the fact it would throw out some good stuff and keep some bad stuff, I kind of like the nostalgia of the old conversations. Right now I'm up to 2003, as we move into Iraq. Dang, I wish "Git-R-Done" wasn't so Larry-the-Cable-Guy-ish!